In many narrow economic indicators, such as wealth, income, and housing, the United States ranks near the top of countries in the Organization for Economic Cooperation and Development (OECD). However, when it comes to broader measures focused of well-being, the U.S. does not perform very well. In terms of life-work balance, the OECD ranks the U.S. 30th out of the 38 countries included in its index. As also pointed out by the OECD, the U.S. is the only member country, which fails to offer any type of nationally mandated paid leave policies. While some states, or cities, provide paid family and sick leave, at a national level no such policy exists. Furthermore, most OECD members also mandate paid vacation, a concept foreign to many American workers. The Washington Center for Equitable Growth used data from the Bureau of Labor Statistics Current Population Survey to show that the problem of overwork in America is present in all types of professions. Working over 40 hours a week is fairly common for workers regardless of education level or profession. For example, over 40 percent of those in management positions and over 30 percent of those in farming, fishing, and forestry work over 40 hours a week. Overall, Americans seems to work more hours per year than their counterparts in other countries. The OECD estimates that American workers put in almost 1,800 hours per year. This estimate is obtained by dividing the total hours workers by the number of workers and includes both part- and full-time employees. While the OECD warns about the fact that data for each country is collected using different methods and is thus not strictly comparable, it does provide a reasonable approximation. 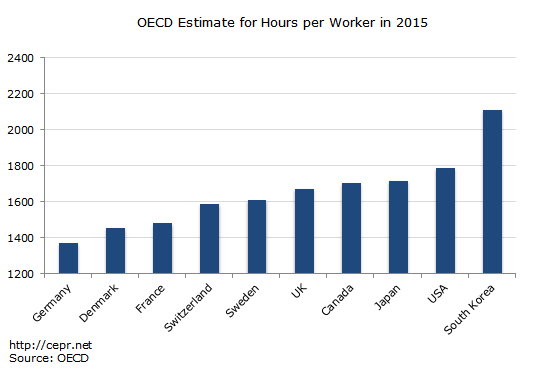 The figure above shows the OECD estimates for average hours per worker in 2015. By this estimate, workers in Germany averaged less than 1,400 hours per worker, those in France and Denmark averaged less than 1,500 hours per worker, those in Sweden and Switzerland around 1,600 hours per worker, while in the U.K., Canada, and Japan workers averaged around 1,700 hours. The only country that surpasses the U.S. in hours per worker is South Korea, with an average of 2,100 hours per worker. However, while South Korea currently surpasses the U.S. in estimated hours per worker, it is among the leaders in the reduction of work hours since 1972. South Korea reduced average annual hours by over 25 percent between 1972 and 2014. Meanwhile, the U.S. had a reduction in hours worked of just 5 percent over this period. If these trends continue, the U.S. will soon surpass South Korea in average annual hours per worker. It is also worth noting that in South Korea only 10.6 percent of workers are part-time, compared to 18 percent in the United States according to the OECD . Since the OECD estimates divide the total number of hours by the total number of workers, the higher percentage of part-time workers in the U.S. lowers the overall average for hours per worker, compared to data that only used full-time workers.